CAMA recently completed renovations on The Catamount, an event space for longstanding client, The Emerson Resort and Spa. The venue offers more of a rustic feel compared to the rest of the resort but stays cohesive to the overall Emerson brand through natural and elegant design features. A recurring theme throughout the entirety of the resort is an homage to Ralph Waldo Emerson and his appreciation for the restorative effects of nature. Nestled in the Catskills, The Emerson Resort overlooks the Esopus Creek. To create a harmonious blend between the resort and its surrounding nature, CAMA utlized art depicting the creek as a key design feature. Artist, John Harris is featured throughout the Catamount. His artwork thoughtfully highlights the hypnotic movement of water with layers of paint and glaze. Rosalyn Cama (CAMA President and Senior Interior Designer) notes, "Harris most aptly catches the movement of the [Esopus Creek] rapids , which in some locations are hidden from sight, yet audible anywhere within the Catamount". 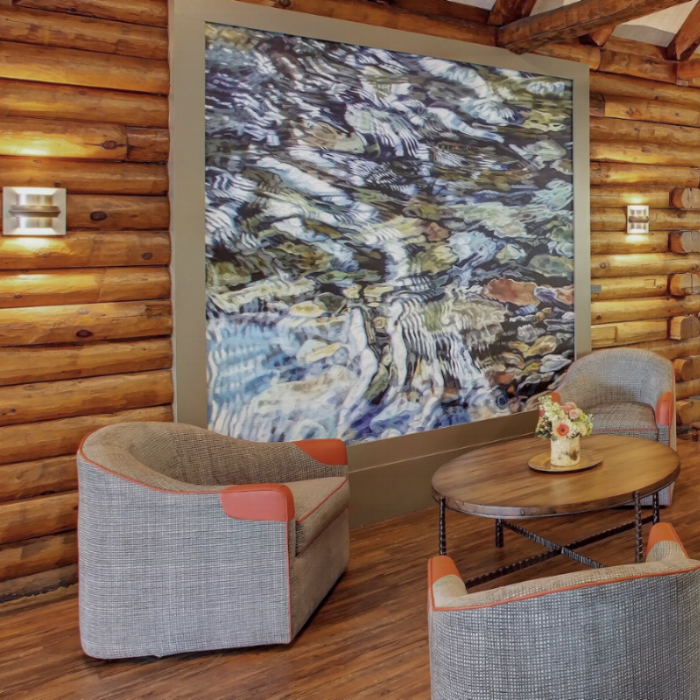 The addition of John's paintings at The Catamount create a peaceful, warm and inviting atmosphere. To learn more about The Catamount visit here. To learn more about artist John Harris, visit his website here. To learn more about CAMA projects utilizing Healing Art, visit here.